The Boston media are furious at information being withheld about the Boston Marathon bombing. But wait — it isn’t what you think. No, they have not suddenly gotten curious about the sorts of inconsistencies, anomalies and outright lies that WhoWhatWhyhas documented in approximately 80 articles now. No, they just want access to jurors, presumably to tease out still more maudlin “human interest” stories rather than probe for the truth that appears to be hiding in plain sight. What are they in a huff about? In yet another example of the unprecedented secrecy surrounding the Boston Marathon bombing prosecution, the presiding judge still hasn’t released the names of jurors three months on. This has raised the ire of at least two Boston area news outlets. And in a parallel development, convicted Marathon Bomber Dzhokhar Tsarnaev’s lawyers have uncovered evidence of “inflammatory images, headlines, and comments” on those same jurors’ social media feeds — raising questions about their impartiality. But the media pursuit of the still-unreleased juror names is not just a statement on what the extreme secrecy surrounding Tsarnaev’s prosecution means for oversight of our public institutions. It is also a statement on the establishment news media’s priorities. Boston’s WBUR reported Tuesday that the US District Court trial judge, George O’Toole, has so far not responded to multiple motions filed jointly by the Boston Globe and WBUR requesting that the jurors’ names be released. So far, the jury list has already been withheld for over 90 days. Experts cited in media accounts were decidedly critical of the judge’s decision. Phrases like “unprecedented”; “an aberration”; “no possible rationale” — abounded. The longest delay experts could remember for the release of names was 14 days, after jurors convicted the notorious Boston mobster Whitey Bulger. And in a related matter, Dzhokhar Tsarnaev’s attorneys filed an appeal Monday on behalf of their client. They alleged that the government did not prove its case beyond a reasonable doubt and reiterated their argument that the trial should have been moved out of Boston because of a public prejudiced against their client. More than 12 pages of the appeal have been completely blacked out — presumably because they contain personal information about the jurors. Most notably, the motion also documents “the breadth and depth of inflammatory images, headlines, and comments that regularly passed through their [the jurors’] social media feeds,” Tsarnaev’s attorneys wrote. In other words, Tsarnaev’s attorneys argue, that even if the jurors tried to adhere to the court’s admonitions to refrain from communicating about the trial, “the breadth and depth” of what they found on jurors’ social media feeds made that unlikely if not impossible. Because Tsarnaev’s attorneys only have access to “publicly-available” social media posts, there may be even more such “inflammatory” remarks in jurors’ feeds. The appeal also cites several other factors as reasons to overturn the verdict and sentence and hold a new trial in a different venue. 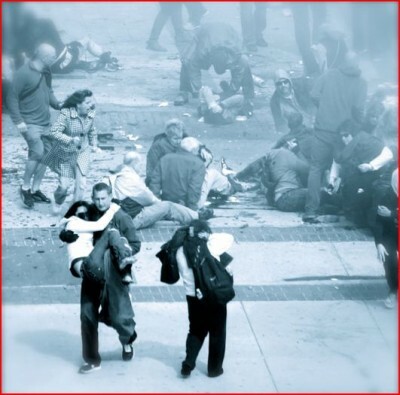 These include leaks from law enforcement; the numerous memorial events held at subsequent marathons; media coverage of victims and survivors and the circus surrounding Tsarnaev’s family’s visit to the United States to attend the trial. Judge O’Toole has steadfastly refused to move the trial despite repeated attempts by the defense. He’s also ultimately responsible for releasing the names of jurors, but has so far taken the unprecedented step of delaying the release for months. Regardless of O’Toole motives, the decision has resulted in less scrutiny of the inner workings of justice. It will be interesting to see exactly what approach The Globe and WBUR might take should they interview these jurors. Chances are, we’ll likely see a lot of front page “human interest” stories, but little scrutiny of the merits of Tsarnaev’s appeal. After all, these are the same outlets who displayed a lack of curiosity about the manyanomalies, inconsistencies, and outright falsehoods in the bombing investigation–yet are now in a tizzy because they have not been granted access to the former jurors. We will inevitably hear emotional stories about the gravity of being on a death penalty jury and having to witness, front and center, all of the gruesome and heart-wrenching evidence. But that won’t help us determine what’s behind all of the secrecy, including nearly 900 sealed court motions. And it certainly won’t answer the many lingering questions about the bombing and its aftermath, including how two novices were able to build and successfully detonate sophisticated and perfectly timed bombs at a public event swarming with anti-terrorism specialists. And it certainly won’t help us discern whether the machinery of justice is operating as advertised. Will the establishment media, clamoring for the release of jurors’ names, have any interest whatsoever in the merits of Tsarnaev’s appeal? Will they question the jurors about their social media activities during the trial? Will they demand that Judge O’Toole unseal the hundreds of secret court motions that ultimately decided what was presented to jurors? Not so likely.